The BRICS New Development Bank (NDB) and the Contingency Reserve Arrangement (CRA), which were established at the Brazil summit, could not have rescued the Indian rupee when it went into tailspin in 2013, even if the bank had existed at that time. No outside financial institution can save an economy in the doldrums or help it to withstand risks from international financial turbulence except its own policies. It was the credibility and the deft monetary hand of Raghuram Rajan, the Chicago University economist and Reserve Bank of India (RBI) governor, who rescued the rupee by immediately taking a number of steps to help increase the country’s foreign exchange reserves, including proclaiming a new provision to attract foreign currency non-resident dollar funds and inflation-indexed bonds to discourage gold buying. The bold initiative helped the RBI to mobilize almost $34 billion in funding and stabilized the rupee. The New Development Bank, with its meager capitalization of $50 billion and another $100 billion for the FCR should not raise false hopes in India. As Raj M. Desai and James Vreeland of the Edmund A. Walsh School of Foreign Service at Georgetown University wrote in The Washington Post: Not all such regional banking efforts have been altogether successful in the past. In 1970, for example, Andean nations established the Development Bank of Latin America, in order to mitigate the stringent rules imposed by the World Bank on infrastructure loans. This has been a success story. But in a similar venture in May 2000, more or less as a reaction to a widely perceived failure of the IMF to halt currency speculation during the Asian Crisis, ASEAN nations along with China, South Korea and Japan established bilateral currency swap agreements, now known as Chiang Mai Initiative. It never got off the ground. Nor did the Bank of the South, established in 2009 by seven Latin American countries to fund regional development. These efforts were initiated partly as a response to the IMF enforcement of strict conditions on countries seeking emergency loans. To be legitimate, effective, and successful the BRICS bank will have to follow international rules of transparency, accountability and monitoring as well as loan practices as stringent as those of IMF and World Bank; in which case the Bricks bank will become indistinguishable from them. 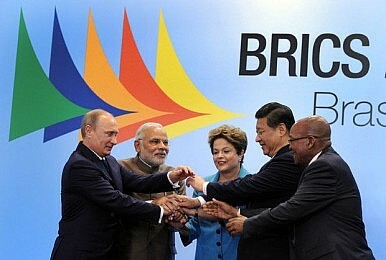 India needs more than BRICS finance. It needs a massive inflow of technology through foreign direct investment (FDI) to build infrastructure, reliable and abundant electric power, highways, harbors, airports, high-speed railroads, irrigation, and water supply. It also needs FDI to speed up manufacturing for export in order to create a current account surplus, which will build foreign exchange reserves and strengthen the rupee. When a country exports high quality goods and services it also exports its culture, which enhances its reputation and builds its soft power. While foreign institutional investment is speculative and can be withdrawn, as happened in 2013 with the U.S. Federal Reserve’s taper, FDI is for the long term and brings in foreign technology. FDI shows the extent to which global corporations trust a country’s manufacturing power. Think of the Taiwanese multinational contract manufacturing company Foxconn, which has invested billions in China to manufacture the iPad, iPhone, Kindle, BlackBerry, PlayStation and other electronic goods. Foxconn cannot just walk away from China. Rather it enhances China’s reputation as a manufacturing hub. With about $4 trillion foreign exchange reserve (of which $1.3 trillion is held in U.S. Treasuries) built on this kind of manufacturing, China’s renminbi will not come under attack. China does not need the BRICS bank, which is to be established in Shanghai, though eventually China might use it to advance its economic diplomacy in Africa, Southeast Asia, where it is aggressively pursuing its territorial disputes, and elsewhere. Russia, which recently struck a 10-year $400 billion gas deal with China, could use a powerful international platform like BRICS to face off against Brussels and Washington in Ukraine and other global hotspots. Although in some ways the creation of the NDB and CRA is a desirable attempt to challenge the West’s dominance of the global financial order and push for meaningful reforms at the IMF, World Bank, and other international financial institutions, India should not allow its growing international stature to be co-opted by China and Russia for their own national interests and global ambitions, whether it’s the Beijing Consensus or the Eurasian Economic Union. To transform India into a global manufacturing power with long-term sustainable growth of 9-10 percent, India needs to develop bilateral relations with countries boasting cutting-edge technological prowess: Japan, South Korea, Germany, Britain, France, Israel and the United States, rather than pursue the Goldman Sachs-created fiction of the BRICS, a random grouping of countries that have neither the inner coherence nor the collective vision to achieve a global economic power shift. Narain Batra, the author of The First Freedoms and America’s Culture of Innovation, is working on a new book, India after India: From Nehru to Narendra Modi. He is professor of communications and diplomacy at Norwich University, U.S.